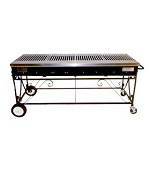 Are you looking for Grill Rentals in NJ? Modern Propane provides Grill Rentals in NJ for homes and businesses. Fully committing to a grill is too daunting for people. Sometimes they just need a grill for one BBQ while others want to try out a few grills before they settle. If you live in an apartment there may not be enough room to keep a grill or you might not use a grill often enough to permanently purchase one. No matter what your reason is for not wanting to buy a grill, there is always Modern Propaneâ€™s gas grill rentals in NJ. At Modern Propane, we offer propane and natural gas products and equipment for all gas grill rentals in NJ. As a BBQ superstore, we aim to give you affordable grilling rentals for a reasonably long period of time. We offer small, large and portable grills as well as grills that provide additional space for holding and storing BBQ food and equipment. We also provide gas services and propane services for indoor and outdoor spaces. There are many benefits of gas grill rentals in NJ from Modern Propane. Renting a grill means you do not have to find a place to store it during the winter months. You also save money because you are not paying the full price to buy the grill and you are also not buying cleaning equipment and other grill accessories. You cannot drag around a large grill you have bought but you can carry a portable rental grill to a park or a neighborâ€™s house to have a quick last minute BBQ. 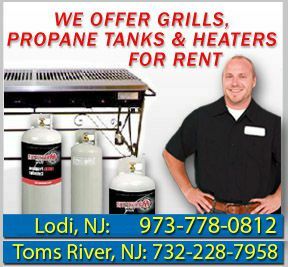 To go along with our NJ grill rentals, Modern Propane also offers propane rentals and refills for NJ gas grills rentals. If you cannot come into the store to pick up the tank, we can deliver it to you in a timely manner. This propane delivery can be serviced within the same day if it is an emergency. Therefore you do not have to do a last minute scramble to find fuel for your grill. We offer propane rentals in many sizes including 50 lb, 60 lb and 100 lb cylinders. For more information on Grill Rentals in NJ, call us today at 973-778-0812.